PRINCETON, NJ -- As House Republicans and Democrats each met separately this week to consider how to handle immigration reform, Americans remain more accepting of immigration than they were even a few years ago. Forty percent currently say immigration should be maintained at its present level, eclipsing those saying it should be decreased, at 35% -- unchanged from 2012. While Americans are least likely to say they want immigration increased, the 23% saying so this year is the highest Gallup has recorded. Americans' current views contrast with much of the prior decade, particularly after the 2001 terrorist attacks, when close to half preferred a decrease in immigration and as few as 12% to 18% wanted an increase. Since 2009, the percentage preferring an increase has risen steadily from 14% to 23%. Nonwhites have consistently been more likely than whites to favor increased immigration. After 9/11, support for increasing immigration declined sharply among nonwhites. This recovered by 2006; during the same time, support among whites increased slightly. However, support among both groups retreated in 2009, possibly in response to the worsening economy. Since then, Gallup's annual trends document a clear, steady increase in support for this pro-immigration stance, with support among whites rising enough in the past two years to nearly match that of nonwhites. Among nonwhites in this poll, blacks and Hispanics have similar preferences on immigration levels, with 67% of blacks and 68% of Hispanics in favor of maintaining or increasing immigration. Historically, though, Hispanics have been more likely to hold these views. Even Republicans, independents, and Democrats are far from homogenous in their views toward immigration, as each group contains sizable segments on all sides of the immigration question. However, at 46%, Republicans lean more heavily than the other parties toward favoring a decrease in immigration, and are alone in showing plurality support for this view. By contrast, roughly equal proportions of Democrats favor an increase or a decrease, and the 29% favoring an increase is the largest of any party group. 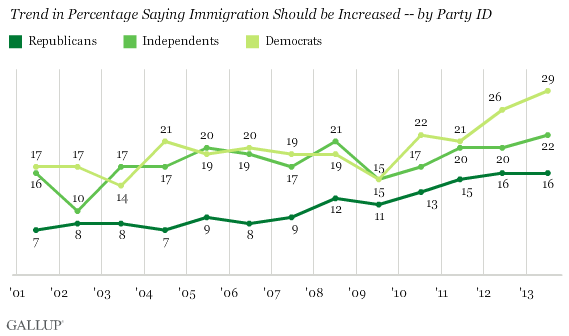 Since 2009, support for increased immigration has grown among all three party groups, but is up most sharply among Democrats. More Americans Than Ever See Immigration as a Plus for U.S.
Seventy-two percent of Americans consider immigration a good thing for the country, the highest Gallup has recorded since it first asked the question in 2001. Americans have grown more favorable toward immigration in recent years, reversing some anti-immigrant entrenchment that occurred after the 9/11 attacks, and again after the 2008 Wall Street financial crisis and its economic sequelae. As such, the current public opinion environment relative to immigration, broadly, may be more conducive to passing comprehensive legislation to address illegal immigration than it was the last time Congress made a serious effort to pass it, in 2007. At that time, the plurality -- 45% -- thought immigration should be decreased. Support for increasing immigration remains the minority view, but one that has steadily gained support, not only from Democrats and nonwhites, but among whites and across the political spectrum. For results based on sample of 2,149 non-Hispanic whites, the maximum margin of sampling error is ±3 percentage points. Samples are weighted to correct for unequal selection probability, nonresponse, and double coverage of landline and cell users in the two sampling frames. They are also weighted to match the national demographics of gender, age, race, Hispanic ethnicity, education, region, population density, and phone status (cellphone-only/landline only/both and cellphone mostly). Demographic weighting targets are based on the March 2012 Current Population Survey figures for the aged 18 and older U.S. population. Phone status targets are based on the July-December 2011 National Health Interview Survey. Population density targets are based on the 2010 census. All reported margins of sampling error include the computed design effects for weighting. A majority of Americans would vote for six different proposals to reform immigration, from 87% support for a pathway to citizenship to 53% for a law varying the number of immigrants the U.S. lets in, depending on the economy's health.